Are you tired of me going on and on about yard sales? My friend Wendy over at the Shabby Nest is having a Frugal Friday Party. I love Fridays, I love frugal-ness, and I love parties, how could I not join?? They are like old friends~they just add something to your home by simply being there. You can use them to add some color and texture, give height to objects, and have wisdom in the pages to turn to any time you want to. There is just something comforting and wise about them...and are all over at yard sales and thrift stores. You can find at inexpensive prices almost anywhere nowadays in great colors. In the picture above, I just wrapped a strip of scrapbook paper from Hobby Lobby around it, taped the back and added a ribbon. Place it on top of some old books and you're set! All of my little vignettes in my home have some element of greenery/life to them. For the little pot, it's just a terra cotta painted white and I wrapped some twine around it for a little somethin' extra. just a few little frugal friday tips. Fabulous ideas. I love old books too! I love succulents. I always see them at Trader Joe's, but I never pick any up. Maybe I will now! 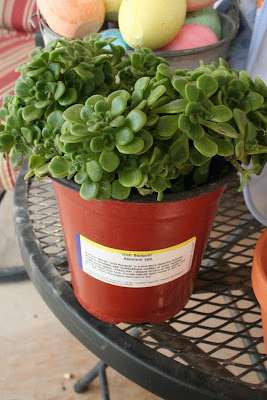 Good to know about succulents - I'll have to try them out! Keep your fingers crossed! I've been known to wrap a ribbon or a piece of jute twine around a candle, but I didn't think of wrapping a piece of scrapbook paper around the candle -- and just that one extra step makes such a difference! Your wrapped, be-ribboned sittin'-on-top-of-some-books candle looks fabulously adorable! And so simple! Yea! Good tips! Your plants look pretty. I tend to kill my plants, but I should get more because I love the way they look! Thanks for the succulent idea! I am pretty anti artificial green, but can't seem to keep the real stuff alive. I love how it does add warmth to each vignette! Great ideas! I love the books tied with ribbon! Love all your ideas. I'm a yard sale fanatic myself and I'm always amazed at some of the bargains I find. 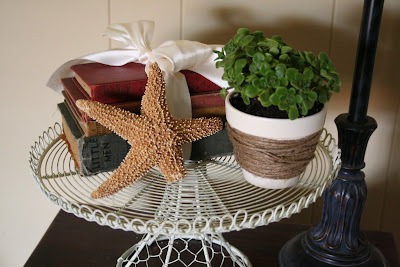 The white pot with the twine wrapped around is such a cute idea, very beachy look. I have books in every room for decor, they are so versatile! Love the candle idea, and the succulents are so cool, just wondering if my cat will take a shot at eating those too. Normally, we keep the plant life outside because of her...but I love them! I have old books everywhere and I think they will be getting some ribbon very soon! Cute! My house is overflowing with my husband's books, but I doubt my husband's Star Trek novels with looks classy on an end table even if they had a little ribbon tied around them! Lol! i love the pot & twine idea! I'll have to make one this weekend-thanks for the inspiration! love the book idea, great way to help raise the height of things. now I have some re-arranging to do. thanks for the tip. Love your ideas - I could do these. I especially love the pot and the ribbon around the books! So cute. your ideas are so pretty. I really like the succulents, and the candle with the paper and ribbon are darling. I've already got in mind what candles I will use to wrap. This is an idea I'll definately use. I love! Love it all! Love the stacks of books (I am a diehard book fanatic) and love the plants. I have been hankering to add some greenery to my home but have been scared to. I bought a peace lily last week and it is still alive (knock on wood). I heard they are hard to kill. Great ideas, I cant wait to incorporate them into my home. Thanks for sharing. I love this post! 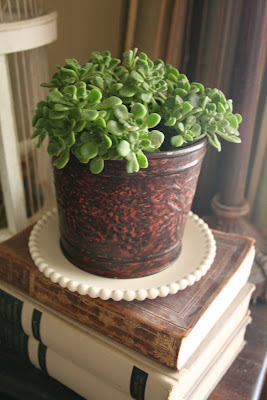 The books, the succulents, the twine pot, the ribbon. I have to try each and every one of them! You amaze me! All wonderful ideas!! Thanks for sharing! Oh, my. 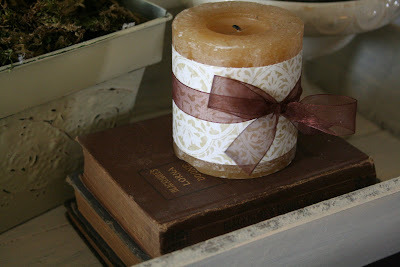 Love the accent to the candle, and I totally need to use old books more. Love your embellishment tricks to ordinary things. Great inspiration and style! Love the details! They really make the look. I love twine. I use it sooo often. In decorating, wrapping presents, when I give away meals.....however, I've yet to try wrapping a vase. Thanks! It's all in the details...isn't it?? ?Great ideas!! Great ideas! I love the pot with the twine around it. you always have such good ideas! love your blog!! Aren't you sooo cute and smart! great ideas. Love the look of books and plants in a home. Love the white pot with the twine! You take such GREAT pictures! I love the one with the books and the candle on top. You are awesome! Wow, thanks for the inspiration! Very simple, inexpensive ideas with great impact. I plan to use all three ideas, thanks for posting. I love the way candles look on the books. and if you could reply - I was reading older posts, the bread looks great...what is dough enhancer? I've never heard of it. You could be dubbed the vignette queen...very pretty.